I’m a firm believer that an important fundamental of organizing is labeling. I’m not just saying this to justify the fact that I own 5 label makers (time for an intervention?!!). In case you were wondering, they are all different and I view it the same as a chef who owns different knives for different purposes! Last week I helped a client organize her mother’s assisted living apartment. Her daughter felt the apartment was in need of some editing and organizing, since her mother had lived there for a number of years. Now in a wheelchair full time, my client’s mother depends on the aides to dress her. We discovered that the mom’s dresser was a bit of a disaster. This was understandable given that the aides vary by day, shift, etc. 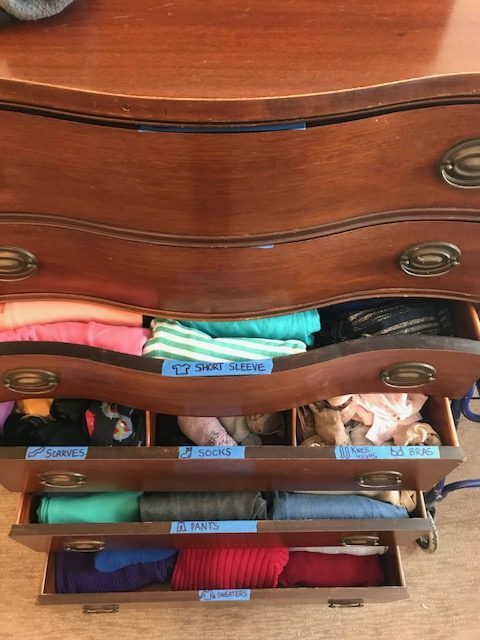 I suggested we label the top lip of each drawer using painters tape to identify what was in each drawer. Painter’s tape is not permanent, won’t damage the finish, and putting it on the lip means it won’t be an eyesore when the drawer is closed. See my photo below. You don’t need a label maker to make labels. They can be made using a variety of products: post-its, masking tape, painter’s tape, file labels, index cards, scotch tape, etc. What’s labeled in your home that has helped with your organization? I’d love to hear about it!